I love matcha ice cream. I had a go at making some during the summer and you’re right when you say the powder has kick to it. Even though I was aware of that I put far too much in and it was horrid! Will have to have another go using your recipe in the future. 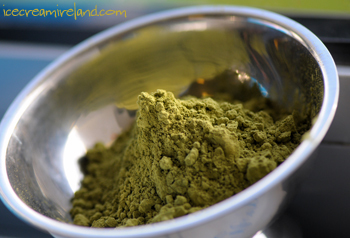 I really wish if I could taste YOUR matcha ice cream as a Japanse person living in Ireland! Would you try to make “Ogura” ice cream some time, which is another Japanese magical taste and also my favorite! Well, I made black bean ice cream, so ogura shouldn’t be too difficult. Where would I find it, though, on these shores? 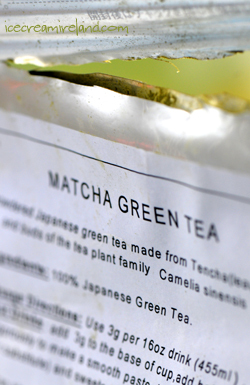 A web search returns many types of Matcha, has Kieran or anyone else any advice on selecting a variety? How about harnessing the flavour of Oolong tea. Has anyone tried that with any success? I’m actually not so au fait with all the different types. I’d say use a good, strong one! OK so this week I made Chai Tea, Earl Grey tea, Oolong tea and Matcha tea ice-cream for comparison and they’re all fantastic and went down very well with the people I’ve fed them to so far! I thought Chai tea worked very well as a substitute to Earl Grey with a more natural sweetness and the Oolong was also a very interesting unique flavour. Match tea I’d never had before but love the taste of the ice-cream and the green colour. 4 very nice teas that all have individual flavours which transfer very well through the ice-cream. Goes very well with chocolate brownies by the way! Hooray!! 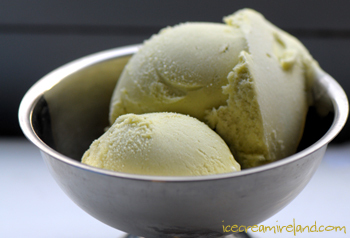 I just realized that you had green tea ice cream recipes on the blog, and I couldn’t be happier. Your ice cream base is the very best I’ve found, and I’ve never been completely pleased with any of the other green tea recipes I’ve tried. Off to try this one, I can’t wait to taste the results! I would have to say that the 2nd picture looks much more appetizing than the first! I have seen this green tea ice cream at Japanese restaurants but have never had the guts to try it. After reading the ingredients.. it looks promising. Kudos.